What is it that unites the human spirit with another? A flag? A credo? Maybe, a language? At present, the answer seems to be more-so abstract: the will to overcome. 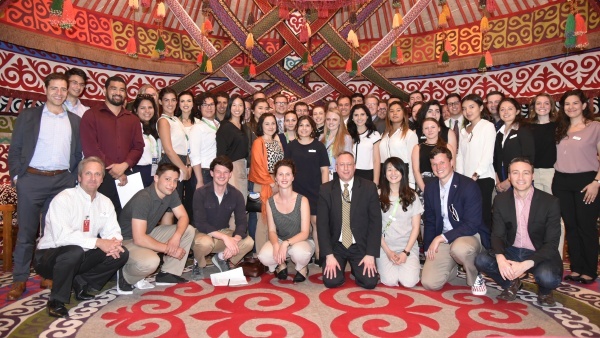 Thus, as June 10th quickly approaches, Expo 2017 in Astana has set forth a rather lofty goal for its participants: to unite in a worldwide discussion on countering the effects of climate change that have so dramatically changed the makeup of the world on which we must all coexist and for which we all carry responsibility. As student ambassadors on behalf of the United States, we have been repeatedly told that we, the hopeful leaders of the future, are the source of infinite energy. Therefore, it is for the next three months that we set out to do that which has never been achieved before. We must, in short, partake in and bolster the worldwide effort in solidarity against climate change, and the harmful practices that have caused it. Our means of doing so are simple enough. Through our unique experiences, individual worldviews, and, most importantly, the pride that is shared amongst all Americans, we will work to spread the word on climate change, and showcase new technologies that harness the potential to reverse the path of destruction of the world’s environment. As daunting as this task sounds, it is one that has been undertaken by the vast majority of sovereign nations across the globe. From the erosion of the Great Barrier Reef to the natural disasters that have increasingly plagued citizens of the world, the evidence has never been clearer. It is our time to act, and we must do so with a newfound invigoration and resolve. This is what the 2017 Expo in Astana represents. So, we, the 40 students from across the United States, have embarked on a 3-month sojourn to inform the countless guests who will visit our pavilion about the initiatives that have already taken shape to take back the fate of our planet into our own hands. This is what the Expo means to me. Are you ready?